I hope all is still well with you and the family. I started playing hockey 6 months after surgery and continue to play to this day at a very competitive level. My hip is stronger than ever. 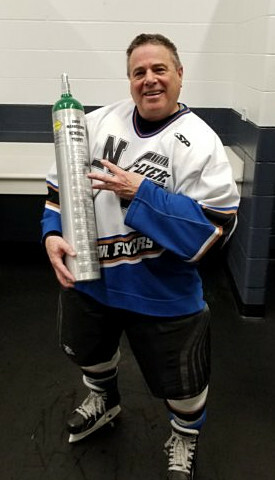 I am now 65 and play ice hockey at the 40 and over Gold level in Rolling Meadows Illinois. We just won our third straight hockey championship. It’s been so long since surgery, I tend to forget I even had it. Going from walking with a cane to being as physically active as I am today, is a miracle as far as I am concerned. I have a new 18 month old grandson that I babysit twice a week. He wears me out more than ice hockey ever did, LOL. I travel, I bike a ridiculous number of miles for a 4 season region, I walk, and as far as I can tell I can do just about anything. Enjoyed a 16 day trip to Italy two years ago. We walked that entire country (pain free). I guess you can tell I am very happy with my life. I doubt I would have been able to be this way if I didn’t stumble upon your website. For that I am grateful to you forever. It was there that I received the knowledge, encouragement, and courage to move forward with a very controversial BHR surgery. I can only imagine how many people like me you and your very unbiased site has helped. For that THANK YOU! I hope you continue to enjoy great health. I see the site is still up, so I am guessing that the naysayers haven’t overwhelmed it. I am so glad you allow them a forum to speak their opinions too. Everyone deserves to voice their opinion. For me, my opinion is based on 12 years of pain free life.